It has been clear on a number of previous occasions, that Nagelsmann adapts his team’s structure in possession to create an advantageous structural interaction against the opponents’ defensive shape. This game provided yet another example. Against the typical 4-2-3-1/4-4-1-1 that Dortmund defend in, the away side played a 3-4-2-1 in possession, a slight adaptation from their usual 3-1-4-2. With the 3-4-2-1 the idea appeared to be, using the positioning of the 10s between Dortmund’s FB-CB channel and the threat of runs in behind to pin Dortmund’s full-backs and prevent them from joining the press. The high and wide positions of the wing-backs would make it tough for Dortmund’s wingers to create access to press Hoffenheim’s wide centre backs. And if Dortmund’s wingers do press, the need to block the lane to the wing-backs would reduce Dortmund’s ability to block the half spaces. With the double pivot playing either side of Dortmund’s 10, they could either find these players under little pressure facing forwards, or tempt one of the home side’s holding midfielders further up, and increase the space behind the midfield for their 10s. With a positive structural interaction in place, the key would be for the players to read the pressing response from the opponents and adapt to that. The plan worked to a degree, with the back three usually able to build with little pressure, and open lanes in the half spaces for the away side to find Kramaric or Bittencourt behind Dortmund’s midfield. Despite being able to play to the 10s behind Witsel and Dahoud, they were usually unable to further develop the attack for a number of reasons. From their 4-2-3-1, Dortmund often created an extremely compact diagonal 4-2-2-2 pressing shape, which worked well to block the typical routes of progression of a 3-4-2-1 shape. This happened primarily on Dortmund’s left side since Hoffenheim mostly built through their right. Guerreiro would move to press Hoffenheim’s wide centre back, blocking the pass to the wing-back outside them, whilst Götze moved to narrow the backwards passing lane to Hoffenheim’s central defender. 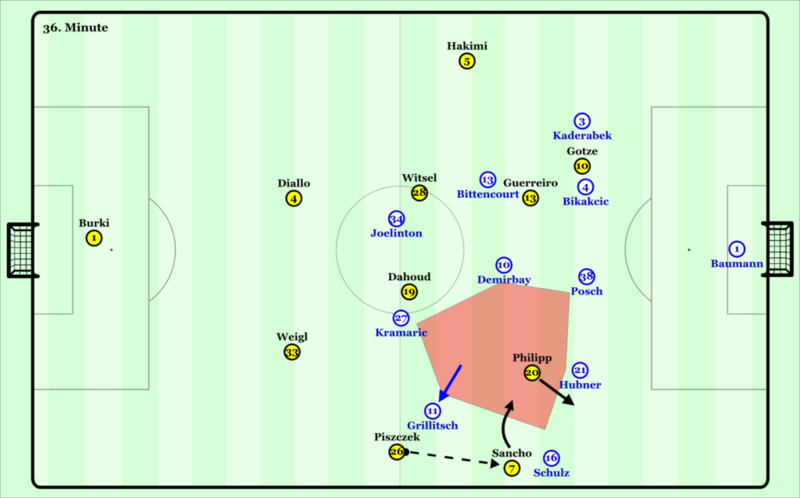 Philipp would threaten the passing lane to Grillitsch, whilst Witsel moved up to mark Demirbay. Dahoud and Sancho formed a covering layer behind the four pressing players. With this scheme, the only clear passing option on the near side of Dortmund’s structure was to Bittencourt in the space behind Witsel. However this pass was quite simply defended with Hakimi moving up quickly to prevent the German turning towards goal, whilst Witsel would work backwards to close the path to dribble centrally. With Hakimi pressing quickly from behind, Bittencourt would start high before dropping to receive the ball safely, but this movement meant he had a poor direction/momentum and field of vision for the next action. Since Hakimi was defending narrow, Kaderabek’s movement would be crucial to progressing the attack. By moving forwards on the wing whilst the pass moved towards Bittencourt, he would be available to provide a first time passing option, allowing Hoffenheim to briefly outplay the pressure. However, supporting movements like these were either too slow or not done at all. At this point Hoffenheim’s attacks usually broke down, with the inability to create structures to outplay the pressing on the near side meaning they were not able to switch out of Dortmund’s pressing. In their defensive phases, Hoffenheim played in a 5-3-2-0, with Bittencourt dropping to play right 8 and Kramaric forming a front two with Joelinton. The away side’s strike pair put no pressure on Dortmund’s centre backs, simply aiming to prevent Witsel and Dahoud receiving the ball by blocking the lane between the midfielders behind them, and the ball carrier. This allowed the midfield 3 to stay compact and focus on covering the 10 space. Dortmund would thus have to use their full-backs in early build-up. If Nagelsmann’s men could press Dortmund’s full-back with their wing-back, the midfield 3 could stay narrow, and they could use these moments to force Dortmund backwards. The Bundesliga leaders started their build-up in a wide 4-2-3-1, due to the lack of pressure on their early build-up they could move the ball freely and gradually move into their asymmetric build-up structure. In particular, Hakimi would move higher on the left, allowing Guerreiro to roam infield, with Witsel dropping wide in the left half space and Dahoud in the central 6 space. Their build-up mostly started on the left, with early passes to Hakimi, before playing back to Diallo, and finding Dahoud or Witsel in the 6 space. This was possible due to poor covering from Joelinton leading to big distances between him and Kramaric. From there, Dortmund could either combine centrally with the likes of Guerreiro and Götze, or switch again but with extra space for Piszczek in the right half space. Favre’s side increasingly gained control, and enjoyed a totally dominant final 15 minutes of the half, where they were able to reach the final 3rdwith ease, with this period leading to their 2-0 lead at half-time. Since they were reaching the final 3rdmore often, Dortmund played more often in their narrow structure, loading the central areas with Guerreiro and Sancho playing more infield. These closer distances meant more options to combine centrally once they could access spaces within Hoffenheim’s defensive shape. With Hoffenheim’s 8s constantly responsible for pressing Hakimi and Piszczek, the workload took its toll, resulting in lower intensity, thus worse pressure and compactness. With more time and space on the ball, it became easier for Dortmund to perceive and access the 6 space behind Hoffenheim’s strikers, and behind the Hoffenheim 8s when they moved out to press Dortmund’s full-backs. Guerreiro and Sancho in particular became increasingly prominent with diagonal dribbles and combinations towards goal, taking advantage of the space Grillitsch and Bittencourt left behind. Another effect of Dortmund’s narrow final 3rd structure was an intense counterpress, with quick backwards pressing from the forwards, as well as a narrow rest-defence structure. This combined with the away side mostly winning the ball in deep positions, meant they often played early balls into depth for their strikers. Since these were usually in clearly underloaded situations, Favre’s side were able to comfortably start another build-up after winning the ball. In one of these situations where Kramaric actually secured the long ball, another issue which had been developing through the half reared its head and led to Götze’s goal. On several occasions Hoffenheim’s double pivot, Demirbay and Grillitsch, were overly ball-oriented when counterpressing with little consideration for the space that developed between them and the back line. As such, once Hoffenheim’s initial counterpress was broken, BVB could attack Hoffenheim’s last line of defence directly. With Borussia Dortmund deservedly 2-0 up at the interval, Nagelsmann made a number of changes which were highly effective in changing the rhythm of the game. This included two half time subs, with Belfodil on for Kramaric, and Geiger on for Demirbay. The most obvious change was in their approach without the ball. Hoffenheim’s strikers now pressed Dortmund’s first line of build-up, including running through on back passes to Bürki. Whilst the basic pressing shape remained similar, the whole shape moved one line forwards, additionally the speed of access and willingness to move out of position early was now far higher. Hoffenheim’s near striker would press, whilst blocking the lane to the near Dortmund 6. This would allow Hoffenheim’s near 8 to stay deeper and block flat passes through the half space. The ball-far striker would stay high preventing Dortmund from switching through their defensive line. Crucially, Hoffenheim’s 8s, Bittencourt in particular, were quick to move from being deeper to block flat passes when the centre backs had the ball, to moving up to press the near BVB holding midfielder when Hakimi or Piszczek had the ball. Kaderabek and Schulz pushed extremely high, particularly on the near side to press Dortmund’s full-backs. The ball-far wing-back didn’t drop to make a 4, but stayed slightly higher with the aim of having a better position to push forward in case of a switch. This ambitious 3-2-3-2 pressing structure led to several turnovers in Dortmund’s half and a number of chances. Perhaps this was partly due to the home side adjusting to the changes from their opponents. On a number of occasions, they attempted passes which were safe from pressure in the first half but less so against the away side’s active pressing. Nagelsmann also altered his side’s in possession structure once again, now playing more of a 3-1-5-1 shape. 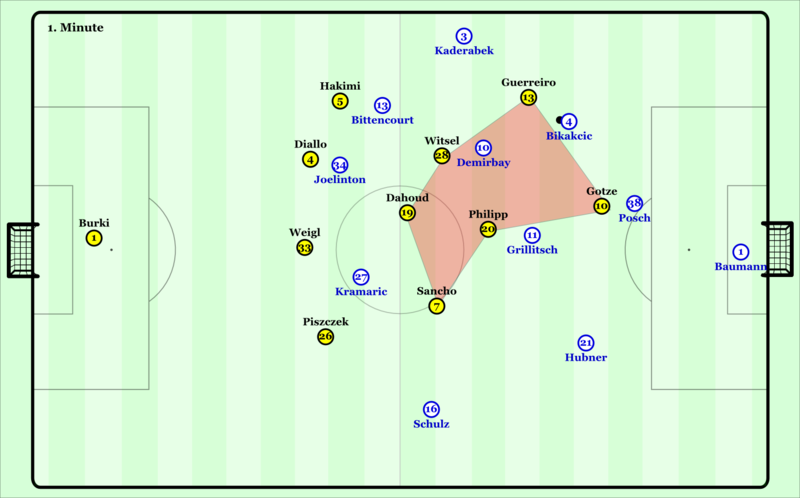 As they did against the ball, Kaderabek and Schulz moved much higher earlier in Hoffenheim’s build-up, with a bigger emphasis on giving offensive width, and running in behind Dortmund’s defensive line. Grillitsch now played as a lone holding midfielder. Dennis Geiger would drop in front of BVB’s midfield during some build-up moments, before moving into a left 10 position later in the attack. Bittencourt’s role remained the same, playing behind Dortmund’s midfield in the right half space. Belfodil now occupied the central forward role, whilst Joelinton now dropped into a central 10 type position in the gap between Witsel and Dahoud. Joelinton’s role change was particularly crucial in Hoffenheim’s improvement offensively, with the young Brazilian heavily present in their best build-up and attacking moments. In build-up, he provided a great platform to progress the ball. Positioned either on or just slightly behind the Witsel-Dahoud channel, he could hold the ball up and lay it off to team-mate’s with good conditions. Joelinton was also helpful when Hoffenheim played infield from the wing-backs. Geiger and Bittencourt would make underlapping runs if the ball carrying wing-back didn’t have space to carry the ball forwards. These runs opened the lane to play further infield, where Joelinton could initiate combinations or dribble towards goal. 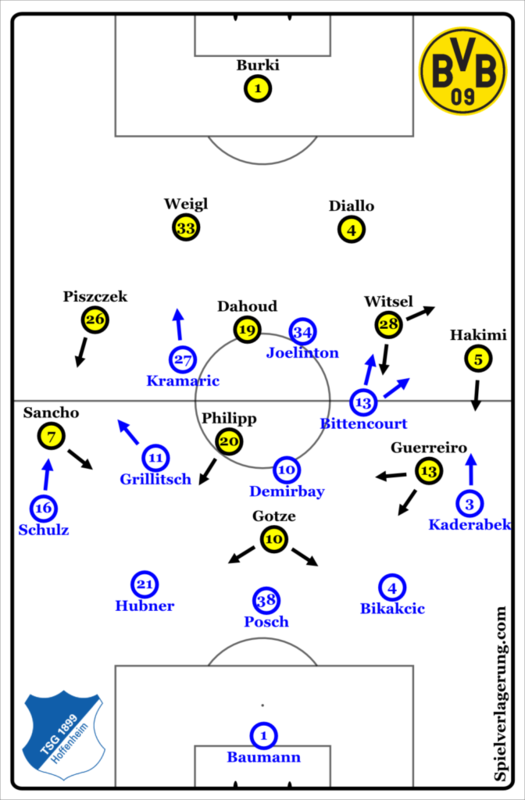 Whilst these changes were effective, and Hoffenheim created several chances, they found themselves 3-0 down, after a rare example of Favre’s side using the available space in Hoffenheim’s half to go for goal. The game then hinged on the 75thminute, where Hoffenheim’s failed press led to Sancho hitting the post, with the away side working the ball upfield and scoring from the resulting ball recovery. 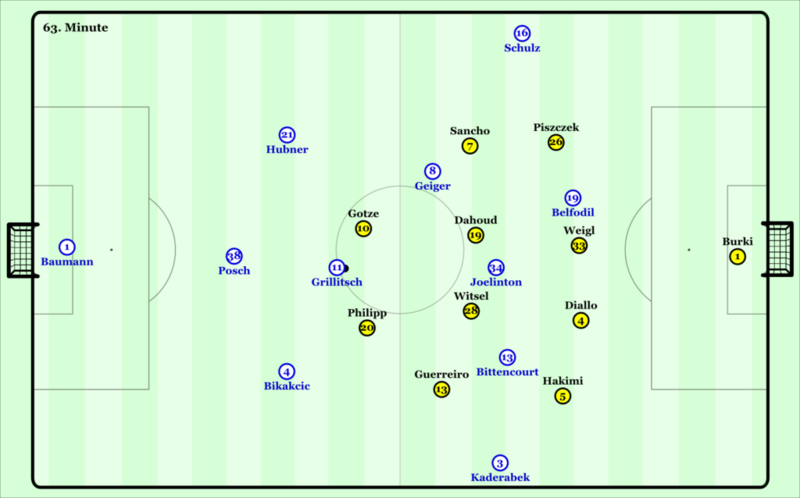 The basic rhythm of the game remained fairly constant, with Hoffenheim dominating territory, whilst Dortmund were able to create dangerous moments of their own. Dortmund brought on Toprak and switched to 5-4-1, seemingly to better deal with the huge width in Hoffenheim’s attacks, either by avoiding crosses coming in, or defending the ones that came in better. Yet it was a cross which led to Hoffenheim’s second goal, seconds after Toprak’s introduction. Eventually, Hoffenheim were rewarded for their ambitious pressing and the number of players they committed to attacks with a late equaliser. With Dortmund convincingly the better side in the first half, and Hoffenheim clearly dominant in the second a draw was perhaps a fitting result.